CPR stands for Catch, Photo, Release. In our CPR tournaments, length rather than weight is the basis for scoring of each competitor’s catch. Basically, one catches a bass, lays it on a Hawg Trough or Ketch measuring board, and takes a photo using a smart phone. The photo is then uploaded using the TourneyX app or placed in the TourneyX app livewell to be uploaded later. The fish is dropped back in the water, unharmed, after having been photographed. Southwest Oklahoma area is considered any public waters within Cotton, Comanche, Caddo, Custer, Washita, Kiowa, Tillman, Jackson, Greer, Beckham, Roger Mills, and Harmon Counties. Each Competitor must only catch fish within the region designated from the Tournament in which they participate in and submit an entry fee. Entry fees will be $35 dollars paid via paypal through the TourneyX registration. TourneyX charges $5 per entrant for the tournament. The remaining fees will be paid to the winners of the tournament. Competitors must have a valid fishing permit or license for the state in which they are competing. The competitor must follow all boating and fishing laws that applicable to them. Any Competitor who desires to compete in a Tournament is required to join the Tournament and pay the entry fee prior to the start of the Tournament. Any Competitor who wishes to cancel their participation in a Tournament may do so at any time before the start of the Tournament. Once a Tournament has begun you are considered as a Competitor for the Tournament. 1. Only “black bass” Species are eligible for scoring. That designation includes the three most common species Largemouth Bass, Smallmouth Bass, and Spotted Bass as well as other less well-known species or varieties of Shoal Bass, Redeye Bass, Suwannee Bass, Guadalupe Bass, Bartram’s Bass, Alabama Spotted Bass, or Mean Mouth Bass. Submission of a photo of an ineligible species will result in denial/disqualification of the photo. 2. The minimum Length scored is 12 inches. Photos of bass shorter than the minimum specified for an Event will be denied. 3. The Condition of the Bass must be hooked in the mouth or jaw. It may not appear to have been snagged, snatched, or hooked in the body or a fin. Bass must appear to be alive. If bass appears to be dead, mutilated, frozen, mangled, or otherwise damage, or it appears to have been mashed, mauled, or otherwise altered, the photo will be denied. 4. Photos must be taken with the left side of the body facing up and mouth facing left with the lip touching the measuring board fence. The tail must be flat against the surface of the measuring board. The left eye, mouth, and gill must be visible in the photo. The mouth must be closed. Any infractions will result in a penalty assed at the discretion of the Tournament Director or a denial of the submitted photo. The tournament identifier code must be in the submitted photo. Either written on an identifier card or on the back of the anglers hand. The codes will be available the day before the tournament within the TourneyX app identifiers link. If fishing in multiple tournaments you can simply write the codes for each tournament in separate boxes in an identifier card. 5. The Standard Measuring Devices are either the Hawg Trough with blackened lines or Ketch Board. On your Hawg Trough you should darken the lines for easier judging of your photos. It is also helpful for judging if you place a different colored sticker of dark lines on the inside of the fence where the Bass mouth is to touch. Fishing is allowed only on publicly-accessible waters within the geographic area designated by the TourneyX Tournament rules. Violation will result in disqualification from the Event. 1. Competitors are not restricted to fishing where they start out and are permitted to relocate to other Eligible Water during the Tournament. 2. Wade, bank, and dock fishing is permitted. 1. All bass must be caught live, the Competitor using only equipment and legal methods that comply with all fishing statutes and regulations of the states and body of water in which they are taken. Competitors are responsible for research of and compliance with all applicable fishing and boating regulations. Snatching or snagging fish is not permitted. When visually fishing a bed for spawning bass, to be admissible all bass must be hooked inside the mouth. 2. All bass must be caught on rod, reel, line and hook with artificial lures only. No traps, snares, set lines or other methods of fishing other than rod, reel and line are permissible, even if legal under state game laws. 3. A break of the measuring device (hawg trough or ketch board) may be mended for use if the repair is rigid and flat and there is no alteration or damage to the measuring surface. 4. Each Competitor must use a mobile smart phone with the TourneyX app. 5. Only artificial lures and biodegradable artificial lures may be used. No live bait, preserved bait, or prepared bait will be permitted during the Tournament. 1. Submit the bass length in the TourneyX app as accurately as possible. Submissions will be verified and any penalties will be assessed by the Tournament Director. 2. Tournament ranking is determined automatically by the TourneyX app. 3. 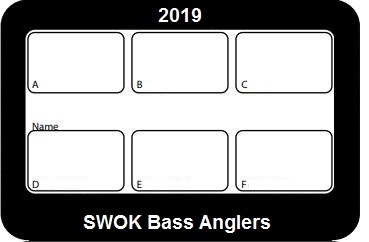 In Tournaments the scores of the five longest bass on the Leader Board when judging is complete will be combined to determine the final score. 4. In the event of a tie in score, the tied Competitors’ longest (highest-scored) bass are compared, and the tie breaks in favor of the Competitor with the longest (highest-scoring) bass. If the longest bass are equal, the second-longest bass are compared and determine which Competitor wins the tie. If the second-longest are identical, the third bass is compared, and if they, too, are identical, then the fourth bass breaks the tie. If all four of the tied Competitors’ highest scoring bass are identical, then the tie breaks in favor of the Competitor whose last Leader Board photo was uploaded earliest. In the event of a rule violation, the Tournament Director may impose such penalties as deemed appropriate, including reduction of score (length), denial of submission, or disqualification from the Tournament determined by the Tournament Director. 1. Reductions in length are typically for the mouth being open or tail being pinched. The amount of reduction will be based on the Tournament Director estimation of how much length had been gained by the violation. 2. Denials of submission are typically for incorrect hand placement, bad or blurry photo, inability of length determination in the photo, or any other violation determined by the Tournament Director. 3. Disqualifications are typically for attempts to cheat during a Tournament, violations of safety of the Competitor or the catch, violations of laws or regulations, photos of fish caught outside the region specified in the Tournament, photos of fish caught from private property, or any other violation determined by the Tournament Director. During the Tournament, every Competitor must adhere to all state boating and fishing laws. As a condition of participation in a Tournament, and by virtue of registering for the Tournament, each Competitor agrees to accept the rules and waive and release all liability. This Agreement absolves the Tournament Director from responsibility and threat of litigation in the case of injury, loss, or death sustained by a Competitor in the Tournament. Get the TourneyX app from google play store or the Apple store.